Acupuncture is a system of medicine which has been used in China and other Asian countries for over 2000 years. It involves the insertion of fine needles into specific points on the body in order to influence the flow of qi through pathways called meridians. The needles are sterile, single use, solid metal, and very tiny. Ten of the largest needles used in acupuncture will fit into the opening of a hypodermic needle used to draw blood! Traditional Chinese Medicine in which points are chosen based on their "traditional function"
From a Chinese Medicine theoretical perspective, acupuncture works by stimulating the flow of qi or vital energy in the meridians. One can look at this like a freeway system in which qi flows like traffic. At some times of day there is more qi in some places than in others. Sometimes, the flow of qi gets stopped (like a traffic accident on the freeway will block traffic). When the flow of qi is stopped or slowed down, there will be too much qi behind the blockage, and too little qi in front of it. 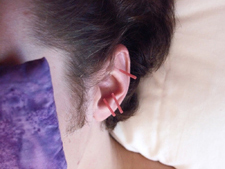 Depending on the type of stimulus applied to the needle, acupuncture will either disperse the qi (like the crew that comes to clear the accident scene), or attract qi. Because all illness is considered within the context of organs having too much or too little qi relative to the entire system, this smoothing of the flow of qi serves to relieve imbalances which cause the symptoms we associate with illness.